Once you know how to make the Char Siu or Moo Dang—I taught you in the last blog— I can proceed to the next step, making Khao Moo Dang. 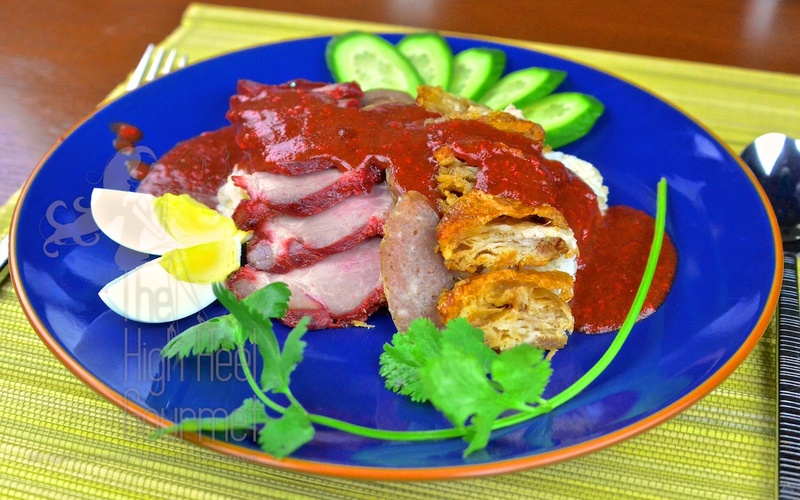 Khao Moo Dang is considered a one plate dish, Khao=rice, Moo=pork, Dang=red. Basically it is a plate of rice topped with sliced red barbecue pork, sliced crispy pork, sliced Chinese sausage, hard boiled egg, and everything topped off with a delicious salty but sweet red sauce. This is a dish that is all about textures. The tenderness of the barbecue pork with a hint of spice in every bite, the crunchiness of crispy pork with salty bits of crackling skin, and melt-in-your-mouth fat. And then the hard-boiled egg and the Chinese sausage, together with crisp fresh cucumber, and don’t forget the fluffy, warm, fragrant jasmine rice, all combined under the red yummy sauce that drenches everything underneath. It’s messy but good messy 😉 If you don’t call this heaven in your mouth, I don’t know what else to call it. Khao Moo Dang is eaten all over Thailand, but probably wouldn’t be found outside Thailand except in a Thai restaurant. In Hong Kong there is a combination of barbecue-meat-over-rice dishes, but there is no signature red sauce on top like in Thailand. In Chinatowns all over the world they also have those dishes, but also none served with a red sauce. It is safe to say that the origin of the red sauce is from the Chinese living in Thailand. In the beginning they probably just boiled the leftover pork marinade and poured it over the meat to add the intensity of the taste to accommodate the Thais’ palate, who are used to very tasty food and consider Chinese food to be “bland.” Later on, the sauce became the deal breaker for the dish, so it has been developed far beyond the original. I like Khao Moo Dang as much as I like Khao Man Gai, or the chicken and rice dish that I gave you the recipe for earlier. My funny tradition is this: I would eat Khao Man Gai for breakfast or lunch and then I would eat Khao Moo Dang for lunch or dinner. This is not anyone’s tradition but mine. Most street vendors that sell Khao Moo Dang try to cut costs by slicing the pork extremely thin. It’s as thin as paper and almost translucent. And the same is true for Khao Man Gai, the vendor will slice the chicken as thin as possible and use the flat part of a cleaver to slap and flatten the chicken pieces so they appear larger. All of these thin pieces of meat would be served over a heap of rice. I always wish they would use less rice because I can’t keep eating the rice alone when the toppings are all gone. I ask them to put half the rice they normally would but, if you ever seen these street vendors, they work so fast and in their own rhythm. If I asked them to break their routine they would get confused and I end up not getting the special order. I have to order the “special,” meaning more meat on top. It’s almost like ordering the “super size,” but then I can’t finish it. The best way was to cook this at home, but I never did. Once I moved to the US, when I missed this simple street food dish I normally would buy my Char Siu from the Chinese market and make the red sauce at home. There is a brand of pre-mix marinade, Lobo that I used to make the red sauce, until a sudden food allergy killed the simplicity of Khao Moo Dang for me. I got a rash from eating the pork from Chinatown! I now have to make my own Moo Dang using organic pork. Remember Khao Moo Grob that I mentioned in the last post and this one? It’s the same dish with sauce and all, just without the barbecue pork or Moo Dang. I like Khao Moo Grob, too, because I can enjoy crispy pork in every bite. 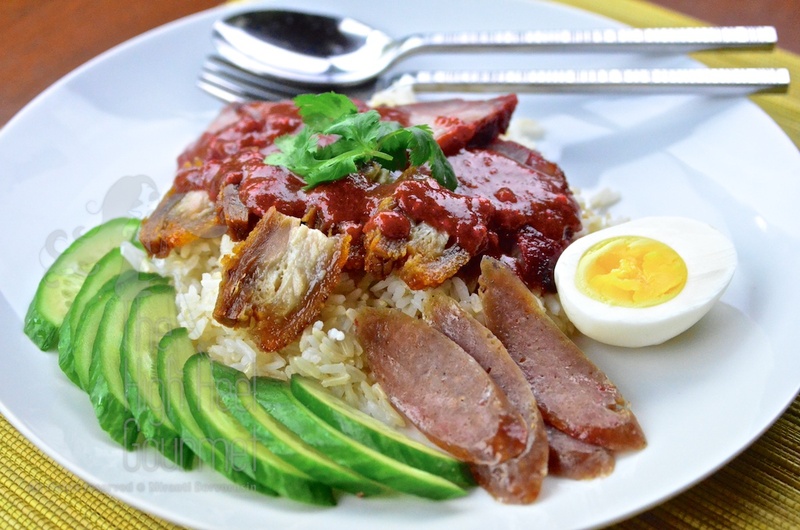 While I was still living in Thailand many moons ago, Khao Moo Dang normally came with red barbecue pork, crispy pork, Chinese sausage (called Gun Chiang in Thai), half a hard-boiled egg, red sauce and some cucumber, unless you ordered in specific such as no crispy pork, no sausage and etc. These days I’ve been told that you have to spell everything out that you want. 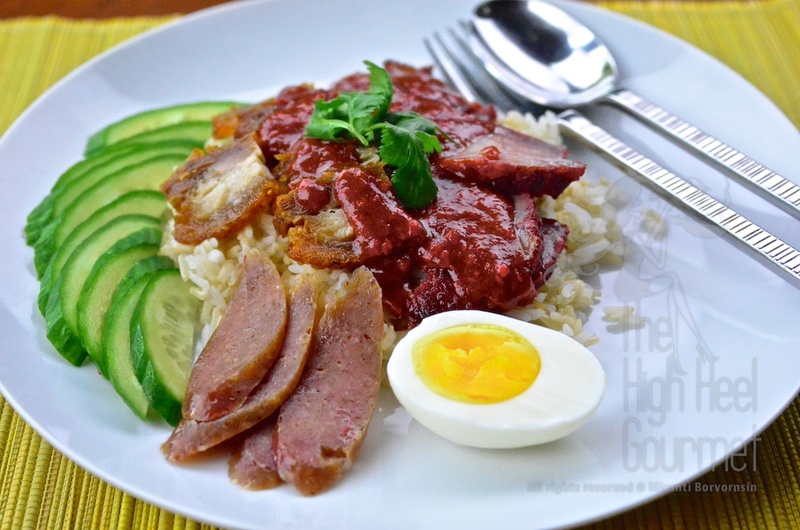 You just order Khao Moo Dang and you will only get the red barbecue pork sitting all alone on top of rice–no sidekick crispy pork, or his helper, Chinese sausage. Also, if you order Khao Moo Grob, the barbecue pork will not show up, just crispy pork. If I want the old style Khao Moo Dang I have to tell them that I want “everything” to get the same combination I’m used to. Okay, that’s enough of my story. Let’s see how we make this delicious sauce. Well, in short, you just mix the leftover marinade and the dipping sauce together, add cornstarch, then add sesame seeds or ground roasted peanuts—which ever you prefer—and THAT’S IT! I’m not kidding. This is not complicated at all, or else I wouldn’t be chatting for this long. 1) Put the marinade, the dipping sauce, and Chinese five spices in a pot, and set it to boil. 2) Mix the cornstarch with the half cup of water, stirring until it’s well blended and has no lumps left. 3) Wait until the contents in the pot reach a boil and then slowly add the cornstarch water, stirring constantly. Wait until it’s bubbling again before checking consistency. If you want it thicker, add more cornstarch. If you want it thiner add more water. 4) Add the sesame and peanuts; taste test it. If you want to adjust the taste, do it now with salt and sugar, wait until it reaches a boil again, then you are done. 5) Pour the sauce over everything. 6) Cut a hard-boiled egg in half and add to the plate. 7) Slice the cucumber and add it on the side. 8) Pick some cilantro leaves and add them on top of everything else. This entry was posted in All Day, Breakfast, Chinese, Clicking in the Kitchen, Comfort Food, Dinner, Egg, Gluten Free, Lunch, Pork, Rice, Roast, Sauce, Sauce, Thai and tagged Asian, Chinese food, Cooking, Easy recipes, Egg, Food, gluten free, Pork, Recipe, Rice, Sauce, Thai food. Bookmark the permalink. Hi Miranti, in the Netherlands in Indonesian/Chinese restaurants, which serve a Dutch interpretation of Indonesian and Chinese food and are mostly run by people from Hong Kong, all serve a red sauce with char siu. It also has tomato/ketchup, but other than your version it also has ginger and red chilli. It actually surprised me that your red sauce doesn’t have any chilli. Is that your personal preference? No, there is no chili in Thai style red sauce. It taste salty and sweet. I think the Indonesian version is the spicy red sauce. Do they pour the sauce over the pork and rice? BTW I’m still have to find out about the coconut milk thing you asked me but I don’t have the coconut milk yet. I will respond as soon as I can find the coconut milk. In the take out version of char siu, the spicy sweet and sour red sauce is served on the side. This is probably so you can pour the sauce over at the last minute, to keep the meat crispy. I checked with my Indonesian friend, they said that is just the spicy dip. They’re not pouring over the whole plate like the Thai. This sounds incredible. But are there pictures? Or is it my internet! There is only 3 pictures of the finished plate only this time. that sauce is making my tummy grumble!